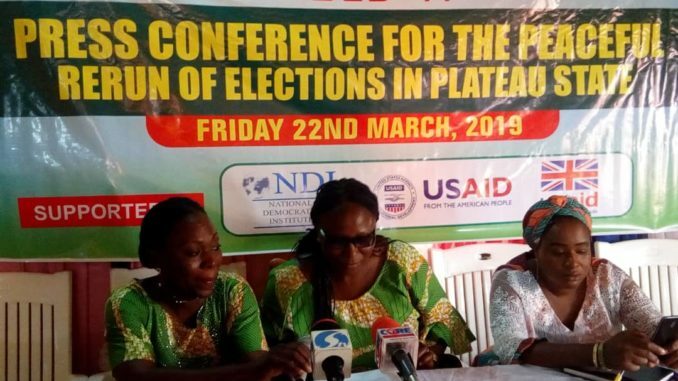 The Nigeria Association of Women Journalists (NAWOJ) and a Non-Governmental Organization (NGO), the Search For Common Ground (SFCG), have called for peace to be maintained before, during and after the Supplementary Elections slated in Plateau State tomorrow Saturday, the 23rd March, 2019, by the Independent National Electoral Commission (INEC). 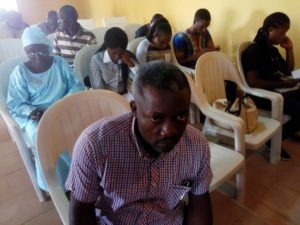 The two bodies in a press conference jointly organized at the NUJ Press Center Jos today, also advised that, though security agents would be need in the exercise, it should not be militarized to the extent that it would cause panic among residents and eligible voters in the rerun polling units and communities. 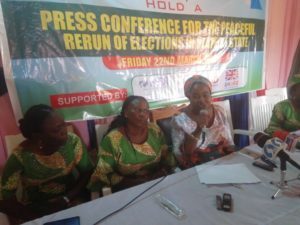 The Chairman of NAWOJ Plateau State, Jennifer Yerima, flanked by her Vice, Nene Dung and the representative of SFCG, Niri Goyit in their press text stated that, “The Search For Common Ground (SFCG) and Women Journalists in Plateau State collectively call for peaceful conclusion of the rerun elections that is transparent, credible and acceptable to all and devoid of any violent reactions. 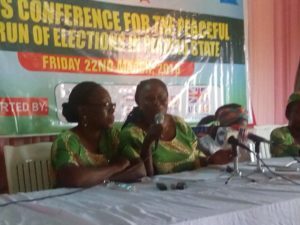 “We note that all hands must be on deck to ensure a violence-free exercise, as Plateau State is dear to all peace-loving residents of the state. “We call on parents, particularly mothers to educate their children on the need for peace and tranquility before, during and after the rerun elections. “Youths in particular must be made aware of the fact that there is nothing to gain in violence. More so since, no politician will provide arms and ammunitions for his or her children to engage in political thuggery. 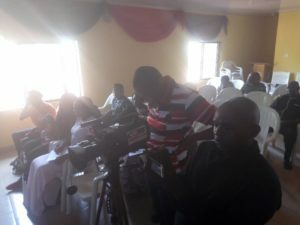 NAWOJ and SFCG, also used the opportunity of the press conference, to appeal to all and sundry not to use their social media platforms to spread fake and unfounded stories, rumours or hate speeches. While reemphasizing that the Military has no business in the exercise, but can only come in when need.